One Plus Seven ~ Lake views! Studio Sleeps 4 ~ 4 Comm Pools! Paradise 30A~One Plus Seven is named for Carillon's one mile of private beach access and 7 pavilions to access the beautiful beaches of Bay County. 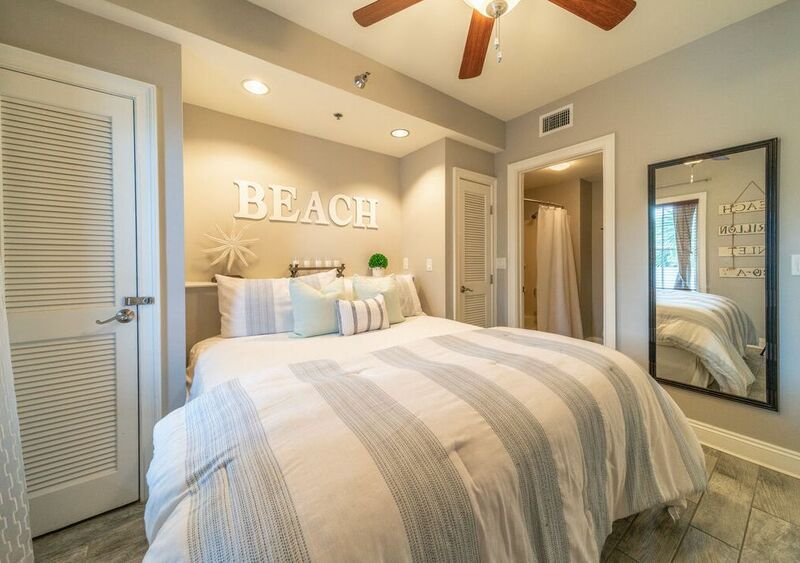 The Carillon Beach Resort Unit 313 is a studio condo, hosting 4 guests on a King sized bed and full sleeper sofa, with breath-taking views of the lake at Carillon. It is located only 2 miles from Rosemary Beach, FL and just 4 miles from Pier Park in Panama City Beach. The harmonious back drop of the sea, sand and sun combined with lush natural surrounding and the old world charm architecture offers a unique opportunity for a wonderful life style; for a day, week, month or for the rest of your life. Carillon Beach Resort Community was designed to provide a luxurious modern retreat with the entire creature comforts one would expect in an exclusive resort community. Carillon is a true haven for the discerning short-term traveler. What should I do in Paradise? 1. Take a walk around Carillon Market Street which consists of retail shops, eateries and galleries. 2. There is 1 mile of private beach for Carillon guests with 7 private beach access points. 3. Recreation includes parks, walkways, swimming, tennis, kayaking, surf or lake fishing, bicycling and snorkeling. 4. Take a yoga class at Yoga Elements. 5. Enjoy an array of fresh tropical treatments at Salon Baliage & Spa. 1. Carillon Beach Resort has basketball and tennis courts, as well as a playground. 2. The beach access is a short walk and Carillon Beach Resort has 3 pools within the gated community. 3. Rent bikes, stand up paddle boards, or kayaks. 1. Paradise Fitness is a gym for guests to use. They have daily and weekly rentals for short term guests. 2. Carillon Beach Rentals have a library and DVD's that can be rented while guests stay on property. Paradise30A - When you book your vacation in Florida's Panhandle, with Paradise Properties Vacation Rentals and Sales, you can expect first class customer service from the moment you inquire. All of our properties are professionally cleaned, inspected, and maintained at the highest level. We are located close to all of our properties and we are available 24 hours per day and 7 days per week to ensure your vacation is flawless. Our goal is to build a lasting memory for all of our guest. The accommodations were perfect & the staff Was very accommodating! Couldn’t of asked for better stay while we were there. The location is perfect away from the hustle and bustle of downtown if you would say that.The private beaches make it perfect and not crowded at all. Thanks for your review. We are thrilled that you had a great vacation and that this property was accommodating to your needs. We hope to see you again in the future! The property was clean, convenient, and very accommodating. I would definitely stay here again. Thank you so much for the 5 star review. We look forward to your return to Paradise30A!